DURACELL 9V COPPERTOP ALKALINE BATTERIES. Duracell COPPERTOP Alkaline Batteries, 9V Size. CASE 12 NEW DURACELL PROCELL 9V 9 VOLT Alkaline Batteries EXP in 2023 !! Long lasting and dependable - even after seven years of storage. 5 out of 5 stars - CASE 12 NEW DURACELL PROCELL 9V 9 VOLT Alkaline Batteries EXP in 2023 !! 129 product ratings129 product ratings - CASE 12 NEW DURACELL PROCELL 9V 9 VOLT Alkaline Batteries EXP in 2023 !! Model Number: PC1604. 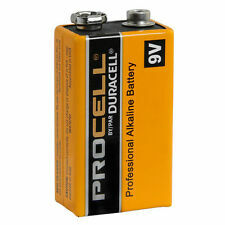 The Duracell Procell 9 volt battery is a strong, long-lasting alkaline battery. DURACELL PROCELL. The expiration date is March of 2023. Manufactured specifically for professional and industrial applications, this battery is among the most dependable, long lasting alkaline power cells available. Trending at $17.75eBay determines this price through a machine learned model of the product's sale prices within the last 90 days. They are designed and marketed to the professional user. DURACELL PROCELL 9V BATTERIES. EXPIRATION DATES 3/2023. 2 Duracell Procell PC1604 9V Alkaline. 8 x Energizer Max 9V Alkaline Battery. Each battery provides 9 Volts of electricity to devices such as smoke alarms, garage door openers, alarm clocks and many more. Equivalent to the: MN1604, PP3HP, 006P, 6LR61, 6LF22, AM6F, 6LF62, HP3, M1604, 1604, 1604A, 1604AC, 4022, 522, 6AM6, 6F22, 9V, 9VOLT, A1604, BLOC, CLR6, K9V, KA9, LR22, ND65V, PP3, 9v-6LR61. Quantity 4 ~ Heavy Duty 9 Volt 6F22 6F22X 6LR61 Battery 9V Free Ship EXP 2023! This is a set of (4) - 9 volt Batteries. This item may be eligible for pickup in Poway, California. Use with smoke alarms and other safety and security devices. EXTRA INFORMATION. Bluedot Trading Policy. (1) Qty 9V 9 VOLT Alkaline Battery Batteries EXP in 2023 ! 9 Volt Super Alkaline batteries provide dependable long lasting power for paint ball guns, smoke alarms, security devices, and garage door openers. The batteries are expired on 2023. No manufacturer warranty. Energizer Industrial. We want each and every one of your buying experiences to be an easy and pleasant one. Maxell alkaline batteries are recommended for Low/Constant drain devices including smoke detectors, clocks, remote controls as well as other applications. (2) 8 Count Pkgs. 9 volt battery. Strong battery. All Products are well-inspected and tested for condition and functionality. The expiration date is March, 2023. 8 Duracell Coppertop 9V Alkaline Batteries. Batteries are dated 2023. Under no circumstances will the dispute be canceled after it has been opened. We do combine orders. We do not know if the manufacture warranty is included, expired or if it is transferable. (1) 1 pc - 9V size battery for household use. 3) Expire DEC 2023. 2 counts of 9v Procell Duracell Industrial Batteries. I strive to offer best customer service. Order process upon receipt of payment and cleared. Ship within business hours (MTN - Time) with Tracking Info posted. Buy 1 get 1 Free! Total of 3 counts. Thanks for looking! GP Super Alkaline 9V. The extensive range makes these products suitable for a very wide range of devices for people of all ages. Extensive range of battery sizes. The extensive range makes these products suitable for a very wide range of devices for people of all ages. Extensive range of battery sizes. GP Ultra Alkaline is especially designed for the most popular portable electronic devices. Extensive range of battery sizes. Duracell Procell 9 Volt Batteries, 17 count, New & Capped, Good until 2023! These are all new and capped with a 2023 expiration date. Duracell 9v Batteries - Pack of 8 - NEW!! Duracell 9v alkaline batteries. Expire March 2023. See pictures for details. 4.5 out of 5 stars - Duracell 9v Batteries - Pack of 8 - NEW!! 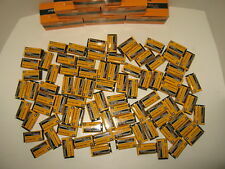 23 product ratings23 product ratings - Duracell 9v Batteries - Pack of 8 - NEW!! GP Ultra Alkaline 9V. GP Ultra Alkaline is especially designed for the most popular portable electronic devices. Extensive range of battery sizes. Duracell Coppertop 9V2 Alkaline Battery Pack x 2 Longest Lasting Coppertop Ever! PP3 1604AU 6F22 6LR61 200mAh. Expiration date: 2023. 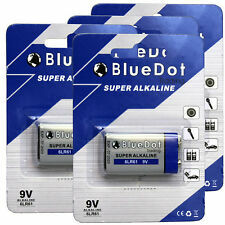 2 x GP ULTRA Alkaline 9V Block Battery. GP Ultra Alkaline is especially designed for the most popular portable electronic devices. Shelf life up to 7 years. EXPIRES 2023 Fresh 9V Duracell Procell 9 Volt Alkaline Battery PC1604 NEW 9-Volt. Condition is New. Shipped with USPS First Class Package. VARTA alkaline batteries are recommended for Low/Constant drain devices including smoke detectors, clocks, remote controls as well as other applications. Lasting power for demanding devices. Features 5 year shelf life. Choosing Panasonic Alkaline Pro Power batteries is the best value for money solution for those everyday appliances requiring more power. Ideal batteries to use for your clock, remote control, scale and other appliances. Choosing Panasonic Alkaline Power batteries is the best value for money solution for those everyday appliances requiring more power. Ideal batteries to use for your clock, remote control, scale and other appliances. PP3 1604AU 6F22 6LR61 200mAh. Expiration date: 2023. 10 x GP ULTRA Alkaline 9V Block Battery. GP Ultra Alkaline is especially designed for the most popular portable electronic devices. Shelf life up to 7 years. PP3 1604AU 6F22 6LR61 200mAh. Expiration date: 2023. 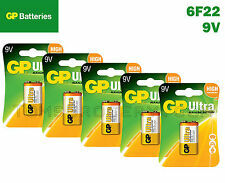 5 x GP ULTRA Alkaline 9V Block Battery. GP Ultra Alkaline is especially designed for the most popular portable electronic devices. Shelf life up to 7 years. Battery alkaline ALKALISK. 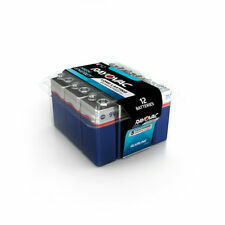 Battery alkaline 6LR61 9V 200.316.04. Keep batteries out of reach of children and pets. To swallow a battery could be fatal. - New, ( x1 ). Special waste handling may be required. Panasonic hearing aid batteries are not only extremely reliable, they also have the most leak-proof, or anti-leakage design on the market. .